I am constantly amazed by your photos. This one is particularly stunning. Awesome tones in this! Very nice! Wow, love the black and white conversion here. Also the perspective is really nicely done. I added your blog to my list of photoblogs on http://fotografiker.se . Keep it up! Very nice! Love the tones in the black and white here. Beautiful! From black to white with the various shades of grays. The composition is stunning. This photo makes me dream of being there in Chamonix Mont Blanc (I did not know the name had been change from Chamonix). 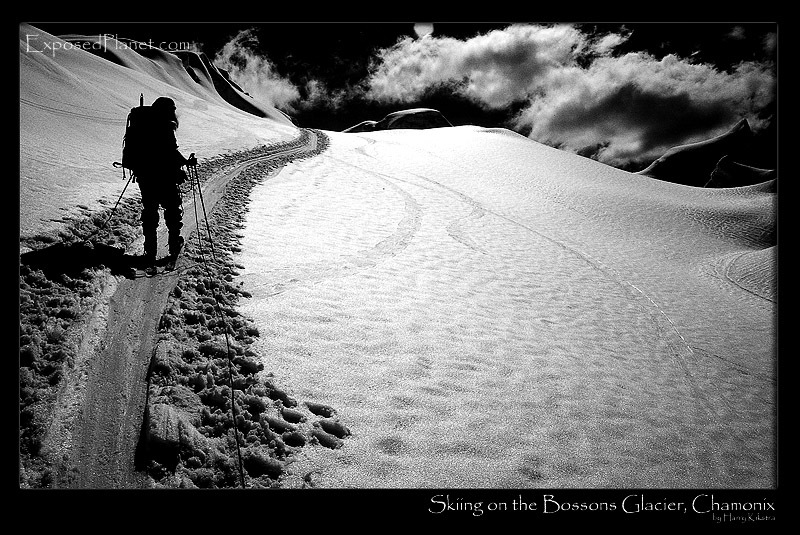 The story behind "Skiing on the Bosson glacier, Chamonix Mont Blanc"
The little village of Chamonix was advised to change its name into Chamonix Mont Blanc as many tourist came to see the highest mountain of the Alps. The old normal route is hardly used anymore except in spring, when it can be skied. Close to the valley, it feels like you are in a different world here. Shot with regular wide angle, no fisheye even though it might appear so, with Canon Eos 3 on B&W slide film, likely in 2003; scanned later.